About a year ago, I was sitting in a coffee shop in Ocala with Jeremy. He was telling me that he was on a spiritual journey of sorts dedicated to his late friend. He told me his heart wrenching story about his friend and I listened to every word with familiarity. His story evoked a similar tale of a friend that I lost, we exchanged stories a bit more before Jeremy smiled and sat back. "We survived", Jeremy said. He went on to tell me that was what his new album was going to be about, survival. Anticipation grew to hear this new album, unfortunately the album was met with setback after set back. Jeremy gave me brief, but curious updates about the album. Finally after long last I got an opportunity to listen to the album. Jeremy who's previous albums were more on the acoustic side decided to abandon that style partly for a slightly new wave sound. While it has synth, it's not a full on dance album. It's upbeat, somber, and it feels like a lost album from the 80s while still feeling completely fresh. The album starts off with echoes of past albums from Jeremy and clips of music which I believe may have influenced Jeremy. The first track feels as though Jeremy is bringing the listener into his world, once inside he begins to meditate on the concepts of love, loss, life, and essentially happiness. What starts as individualized concepts that Jeremy reflects upon with somber attention, becomes universal as the tracks progress. Tracks such as "Facebook Pictures" and "Running Infinitely" depict humanity's yearning for more and simply at it's base a struggle with loneliness in modern times. 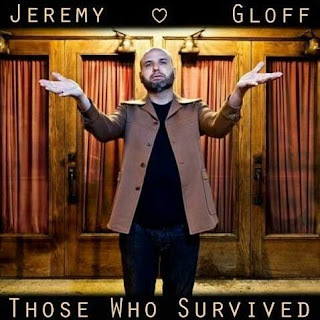 The album concludes with a collage of voices to represent the listeners, to state that the listeners are in fact "Those Who Survived." Life in general is very difficult and takes many casualties, but Jeremy wants you to know that we're all in this together and he understands. If you like good music, don't hesitate to pick up a copy of Those Who Survived! So great to meet you last night. Awesome point of view on the album, I wholeheartedly agree!